Marking and evaluation errors of 93 marks have surfaced in the Joint Entrance Examination (JEE) 2010 held yesterday for admission to 15 IITs, Institute of Technology, BHU and Indian Institute of Mines, Dhanbad. The UPA is in for tough times during the forthcoming Budget session of Parliament, with 13 non-Congress, non-BJP parties today swearing to corner the government on the price rise issue. The BJP has taken serious offence to a German team of MPs reportedly comparing Gujarat Chief Minister Narendra Modi with German Fuhrer Adolf Hitler and demanded an apology from the German ambassador here. As India celebrated completion of five years of National Rural Health Mission today, Assam won the best performing state award among the north-eastern state category for implementing the programme well. The government today said the two regulators SEBI and IRDA have agreed to maintain the status quo that existed before market regulator's ban on 14 life insurers from raising funds for unit-linked schemes. A senior Indian naval officer, associated with the project for acquisition of aircraft carrier Admiral Gorshkov and now based in Delhi, may have been honey-trapped -- a phrase used when women are planted on officials to glean out information. Why pilots succumb to pressure? Reports emerging from Moscow suggest that the pilots flying Polish President Lech Kaczynski ignored Air Traffic Controller warning not to land at Smolensk because of heavy fog at the military airfield and divert to either Moscow or Minsk. Apparently, the pilots chose to take a decision that proved fatal for all 132 persons on board. The Army has initiated disciplinary proceedings against a Colonel accused of sexual harassment by a woman officer. The complainant in this case, sources said, happens to be the same officer, who had earlier levelled similar allegations against a Major General who was subsequently tried by a General Court Martial and dismissed. The government today offered to respond in three weeks to a PIL filed in the Supreme Court demanding that the ongoing Census cover OBC data as part of the efforts to eliminate their ‘backwardness’. The Jharkhand Government will soon formulate a law banning transfer of agriculture land for industrial use, agriculture minister Mathura Mahto said here today. “We will soon formulate a law to ban transfer of agriculture land for industries. There is need to promote agriculture in the state. The Supreme Court today agreed to hear in July a police petition challenging the Delhi High Court verdict reducing to two years the five-year sentence pronounced on Sanjeev Nanda, grandson of late Naval chief SM Nanda, in the BMW hit-and-run case. The Congress today disdainfully dismissed Nitin Gadkari’s criticism of Rahul Gandhi’s “lack of experience” on infrastructure issues, calling the BJP president an “extension board” of the RSS who deserved no response. Asserting that it was always ready to face any challenge to the country's internal security, the Air Force today said any decision on use of air power to tackle the Naxals must follow a clear strategy to minimise collateral damage. The Maoists have links with Assam’s insurgent groups, including the banned United Liberation Front of Assam (ULFA), and tribal militants outfits from other hill areas, Assam Chief Minister Tarun Gogoi said here today. Suspected Maoists have threatened to kill a former Army officer and his family in a Bihar village if he failed to pay them Rs.15 lakh, the police said today. The Maoists threatened to kill Umesh Sharma, retired from the Army, who lives in Muzaffarpur district's Madhu Chapra village, about 70 km from here. The Central Reserve Police Force (CRPF) has suspended the anti-Maoist campaign in the Chhattisgarh's forests following the massacre of 75 troopers, state police sources said today. Internal reports of the CRPF, which has just lost 75 personnel in the Maoists attack in Dantewada, say the force’s field commanders had pointed out lack of training, work pressure and communication gaps as some reasons for losses in operations. Many questions have been found to be out of syllabus apart from concerns that over 75 per cent questions in mathematics were of the Olympiad level — so complicated that only a “coached” student could have cracked them in the allotted time. In that sense, the question paper ran contrary to the recent thinking in HRD Ministry that IITs should discourage coaching institutes. Analysis of the question paper, which IITs started disclosing since 2007 under pressure from the Chief Information Commissioner, reveals problems in paper setting and evaluation in two specific sections — Section II of Paper I and Section IV of Paper II, where there’s no provision for negative marking and more than one answer in the given choices is stated to be correct. Section II of Paper I has five questions, three marks each, for each maths, physics and chemistry and is qualified by these instructions — “there can be more than one correct answers; there’ll be partial marking for partially correct answers and no negative marking for an incorrect answer”. The instruction doesn’t say the ORS sheet of a student who marks all the choices would be treated as null and void. Naturally, with no negative marks, a candidate who darkens all the bubbles (instead of correct ones) can earn full marks without applying any knowledge. “Without negative marking, there’ll be no deduction for darkening the wrong bubbles. If all bubbles are marked, the correct answers would have been anyway covered, giving a clever student full marks without any application of mind. So, he can earn 15 marks each in maths, physics and chemistry, fetching 45 marks in the section,” admits Professor Rajeev Kumar of IIT-Kharagpur. Similarly, Section IV of Paper II (with two questions of eight marks each) says that any given statement in Column I can have correct matching with one or more statements of Column II. Here also, there’s no negative marking and there’s a possibility of more than one correct matching. So, a smart student can match all five statements and get 16 marks (two in math, four in physics and two in chemistry) each, fetching 48 marks in all. Many questions were out of syllabus: like two three-mark questions on superconductivity in Section III of Paper I in physics and one three-mark question in Section III of Paper I on cubic equation in geometry. Together, they will bring cut motions against the Budget and amendments to the Finance Bill, seeking rollbacks of the rise of prices of petroleum, diesel and fertilisers. Separate discussions on the issue will also be sought. Regrouping in the Capital this evening, the long-lost Third Front -- minus the BSP and AGP and plus the RJD -- resolved to put the government on the mat on the rising food inflation and even called for a nationwide strike and protest against price rise on April 27. The meeting was attended by Left Parties leaders Prakash Karat, Sitaram Yechury and Basudeb Acharia of the CPM, AB Bardhan, Sudhakar Reddy and Gurudas Dasgupta of the CPI, SP’s Mulayam Singh Yadav, RJD’s Lalu Yadav, JDS’s Dewe Gowda, TDP’s Chandrababu Naidu, RLD’s Ajit Singh, INLD’s Om Prakash Chautala, AIADMK’s T Matreyan; BJD’s Arjan Sethi, and LJP leaders. Mayawati and her BSP was conspicuous by her absence, marking a departure from old times when the Third Front’s much-hyped launch on the eve of 15th Lok Sabha elections last year happened at Mayawati’s Rakabganj Road residence here. Emerging from the meeting that began with the leaders standing in silence for a minute in the memory of CRPF jawans killed in Dantewada Naxal attack, Bardhan said the party leaders “thoroughly discussed all issues concerning the people” and decided to bring cut motions and amendments to the Budget and the Finance Bill. On cut motions, the 13 political partners decided to coordinate with each other on the floor of the House once the Parliament reassembles after the recess on April 15. The leaders also decided to discuss the Women’s Reservation Bill in detail after the government convenes a meeting of all political party chiefs in the Capital after the House commences. She said Modi had also written to Prime Minister Manmohan Singh about this. Additionally a delegation of BJP leaders led by party vice-president Mukhtar Abbas Naqvi met German Ambassador Thomas Matussek and presented him a memorandum, protesting the German delegation’s comments. Rajasthan was adjudged the best performing state among the high-focus areas while Tamil Nadu claimed the award in the category of non-focus states, where Haryana stood second. In the first two categories, Mizoram and Madhya Pradesh bagged the second positions, respectively, getting awards from Vice President Hamid Ansari, at Vigyan Bhavan. Claiming credit for arresting the infant mortality rate (down to 53 in 2008 from 58 in 2005 when NRHM started) and maternal mortality rate (down to 254 in 2004 as against 301 in 2003), Health Minister Ghulam Nabi Azad said the government was in the process of designing a comprehensive programme on population stabilisation in consultation with the state governments. Azad, however, ruled out achieving the goal through a legislation, saying it would be best for people to come forward voluntarily and adopt family planning measures. “This can be achieved by stopping child marriage, delaying the first child after marriage and spacing the birth, which not only will help in population stabilisations but will also help the mother and the child,” the Minister said. For the record, India has missed the goal of reaching 2.1 total fertility rate by 2010, as envisaged in the National Population Policy of 2000. Ansari emphasised that through the NRHM, the Centre was facilitating the leadership of state governments in setting public health priorities and emphasising human resource and governance reforms. He listed five challenges for NRHM — transition from curative to preventive health care, human resource management, setting of output and outcome targets, convergence and inclusive growth and approaches to public health that look at the different stages of health transition at state and district levels so that appropriate strategies can be adopted. Azad announced a change in focus and strategy in NRHM with a view to adopt an area-centric and area-specific approach to take healthcare to the people living in remote areas. The ministry has already asked the states to identify difficult, most difficult and inaccessible areas so that additional monetary incentives can be provided. He also outlined the recent initiative of adding 10,000 additional PG seats in the next two years. Of these, 4,000 have already been increased for the current academic year. The status quo will be maintained till a court decides who can regulate ULIP schemes, Finance Minister Pranab Mukherjee told reporters here. ULIP is an insurance product in which a bulk of the premiums is invested in equities and bonds. "To resolve any ambiguity and to ensure smooth functioning in the market, the regulators have agreed to jointly seek a binding legal mandate from an appropriate court," Mukherjee said. "Meanwhile, status quo ante is being restored," he told reporters outside the finance ministry. Mukherjee's comments came after a series of meeting between Finance Ministry officials and IRDA chairman J Hari Narayan, and SEBI chief CB Bhave. 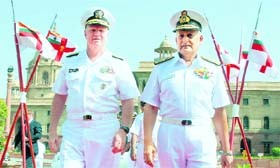 The Navy is conducting an inquiry to find out if Commodore Sukhjinder Singh’s official duties were compromised by the woman. The officer has spent some three years —2005 to 2007 — in Russia as the Indian overseer for refitting the sea-borne aircraft carrier Admiral Gorshkov. Indian civil intelligence agencies reportedly tipped off the Navy and provided evidence in the form of “objectionable” photographs involving him and a Russian woman. Sources said the photographs were “improper”. The last time the officer visited Russia was some eight months ago. Though he has not been directly involved in the price negotiation for the Gorshkov, the Navy will look into all aspects, including his financial dealings, purchase of properties if any and also if any other officer of the Navy was involved. Navy officials said the involvement of the officer seemed to be at a personal level. The truth would be out soon as the inquiry was expected to be completed within a couple of days. Navy sources said the inquiry under a Vice Admiral-rank officer would try to find out if the official's proximity to the woman had had any impact on the Gorshkov deal and also look into the fact if any other aspect was compromised. Pilots here say that sometimes there may be pressure from the VIPs they are flying to reach the destination for important meetings. But many a time, it may not just be the pressure from the dignitary that forces pilots to act in a certain way. If regularly flying a particular VVIP, they sometimes even end up empathising with the point of view presented by their passenger considering their tight schedule and need to make the most of their limited time. And going by the number of fatal air accidents that political leaders, both on domestic and international circuit, have suffered, it does appear to be a plausible reason. An AHCS Boeing pilot recalls how while flying a Prime Minister from Mumbai to Delhi on a foggy day in the Capital, the Captain was categorically told by the VVIP to ensure that the aircraft landed at Delhi, if a decision to take off from Mumbai was taken. “He (the Prime Minister) said he would prefer to stay back in Mumbai rather than risk the flight being diverted to some other airport from Delhi,” he said. Needless to add that after much contemplation the Captain decided to take off and the VVIP landed safely at Delhi. But there is also no denying the fact that saying “no” to dignitaries, especially while flying state aircraft, might cost a pilot his job. There are reports how, when a chopper pilot refused to fly a chief minister because of bad weather, the angry leader complained to the chopper firm and got the pilot transferred. Also recall how a private business jet took off with BJP president Rajnath Singh from Dumka in darkness with just headlights of jeeps providing runway lighting although safety rules prohibit landing or taking off from an airstrip without night aircraft movement facility. Happening within weeks of Andhra Pradesh CM YS Rajasekhra Reddy’s chopper crash because of adverse weather, Rajnath incident led Aviation Minister Praful Patel to urge “VIPs to refrain from taking avoidable risk”. He also cautioned pilots “to strictly adhere to all safety norms”. However, Directorate General of Civil Aviation officials do not agree with the observation that pilots have been known to fly, irrespective of the forecast, because saying “no” to top dignitaries is not an easy option. Although they say that instructions are regularly issued to pilots not to undertake any flight just because of pressure from some VVIP or the management, the fact is that in case of state government-owned aircraft, where pilots are employed by the state, it is altogether a different ball game. There have also been cases when pilots probably overestimated their aircraft’s weather-facing capacity and took wrong decisions. While challenging his posting orders from Bhubaneshwar to Rajouri, the commanding officer of a Territorial Army battalion has levelled serious allegations of corruption against several senior officers, including a recently retired Army Commander. In his petition filed before the Delhi High Court, Col SP Singh of the Bihar Regiment has alleged that he is being victimised and being removed from his command prematurely as he had highlighted professional impropriety on the part of some officers holding important posts. Among the issues raised by him is the ownership of a flat in Bhubaneshwar by a top officer, alleged connivance with contractors and irregularities in recruitment and non--payment of some bills. A retired Lieutenant General, a serving Major General and a Brigadier are among respondents in the case, scheduled to come up for hearing before a division Bench tomorrow. Sources revealed that the Colonel, who was commanding an EME battalion, has been attached to Udhampur and recording of summary of evidence (SOE) was completed a few days ago. SOE is a prelude to a possible trial by court martial and the final decision to convene a trial depends on review of the SOE. The alleged incident occurred in 2008 and the complainant, who was then staying at the Sub-Area Officers Mess, Udhampur, had written to the General Officer Commanding-in-Chief, Northern Command in this regard. Following this, a court of inquiry had been ordered. Sources added that the Colonel, on his part, has denied the allegations and termed it to be a conspiracy to target him due to his association with the court martial of another officer that was in progress at that time of the alleged incident. In the past three years, 12 cases of “exploitation and harassment” of women officers have been registered in the armed forces, out of which punishment to delinquent personnel has been awarded in seven cases. Of the 12 cases, six were registered in the Army, five in the Air Force and one in the Navy. In March, Defence Minister AK Antony’s told Parliament that disciplinary proceedings, Court of Inquiry and General Court Martial are in progress in four cases, while one complaint was found to be baseless. To check the recurrence of such cases, orders have been issued on definition of sexual harassment and the procedure to be adopted fro dealing with such cases. Instructions have been issued emphasising on “zero tolerance” towards such cases. Solicitor General Gopal Subramanium assured a Bench headed by Chief Justice KG Balakrishnan that the government would file its reply to the points raised in the petition, effectively preventing the court from issuing notice. Justices Deepak Verma and BS Chauhan were the other members of the Bench. Naming the Centre, the Census Commissioner and all states and UTs as the respondents, the PIL stated that OBC data was also necessary to set at rest the controversy over the percentage of the OBC population. Arguing for the petitioners, two office-bearers of an organisation from Nagpur, senior counsel DK Garg said the demand was not for a caste-based Census but a Census of “socially and educationally backward classes” that had come to be known as other backward classes (OBCs), the same way the SCs and STs were being covered in the enumeration exercise undertaken every 10 years. The list of OBCs prepared by the Centre or the state government concerned should be attached to the Census form for the purpose of collecting such data as envisaged under Article 340 of the Constitution. This would help extend reservations for the backward classes in educational institutions and for providing equal opportunity in the nature of public employment. Information in respect of OBCs was required for better developmental planning for each category of BCs. “There is no valid reason as to why OBCs are not covered in Census after 1931,” the PIL argued. Of the 79 lakh hectares in Jharkhand, only 34 lakh hectares are cultivable and the rest is barren land,” Mahto told IANS. He said industries could be set up on barren land. “The state produces only half of the food grains it consumes. There is need to promote farming in the state. There will be a crisis if agricultural land is transferred to industries,” he added. 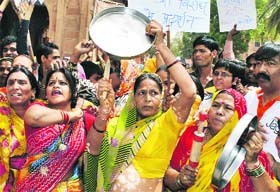 Farmers in the state are opposing acquisition of their land for industries. Mega steel projects like that of Arcelor Mittal have been stalled due to this. Mahto said a draft law would be prepared soon and placed before the cabinet. A three-member Bench, headed by Chief Justice KG Balakrishnan, posted the Delhi police appeal for preliminary hearing in the second week of July after Solicitor General Gopal Subramanium, appearing for the police, argued that the HC had wrongly concluded that the January 10, 1999, accident was a mere result of negligent driving. Six persons were killed in the accident. The High Court convicted Nanda, 31, under Section 304A (causing death by rash and negligent act) of the IPC, which carries a maximum punishment of two years, while the trial court had sentenced him for culpable homicide not amounting to murder under Section 304 (part II) that attracts a jail term of up to 10 years. The Solicitor General said the convict had chosen to drive the car despite knowing that he was drunk and as such the HC should have slapped Section 86 of IPC against him. “We have great respect for the president of the BJP. Unfortunately, I don’t think he has acquired the political gravitas that he be responded from this podium,” said Congress spokesperson Manish Tewari. At the same time, he said his personal view was that the armed forces were not required to fight the Maoists. “We are aware of presence of Maoists elements and clandestine arms deals between them and the ULFA. The ‘tie-up’ is not something new as ideologically there is only a thin line of difference between the Maoists and insurgent groups,” claimed Gogoi. Senior officers were of the view that non-availability of sufficient firing range, lack of shooting practice were some of the reasons for more casualties of CRPF personnel during operations. The reports also mentions a senior officer who looks after training, expressing unhappiness over the training imparted. He said the normal PT/Parades were not getting due importance in Battalions or Group Centres that he felt affects the turn-out and training aspect of men.